The new height-adjustable desk ArchiMeda brings a healthy mix of sitting and standing possibilities into the executive office. The fine wood veneered panel rests on a scissorlift base whose height can be adjusted electronically. 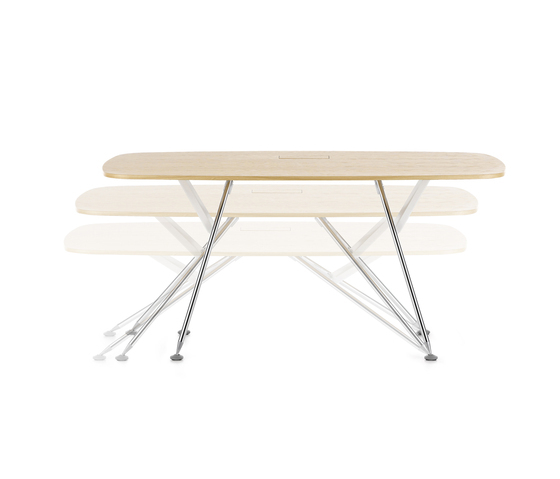 ArchiMeda is suited for use as a table for meetings conducted while either sitting or – especially when reviewing documents and plans – standing. ArchiMeda is a technical object expressing a certain calm and expansiveness. At the same time, the table allows for very rapid adjustments. The mechanically synchronised ArchiMeda goes from the sitting to the standing position in a matter of seconds. The technical device positioned under the table top remains hidden from view. The range of the height adjustment is from 68 cm to 113 cm. Adjustments are simply made at the touch of a button. Part of the high-gloss chrome-plated scissor base remains on the floor while the other part moves elegantly sidewards, with custom gliders protect the under surface.